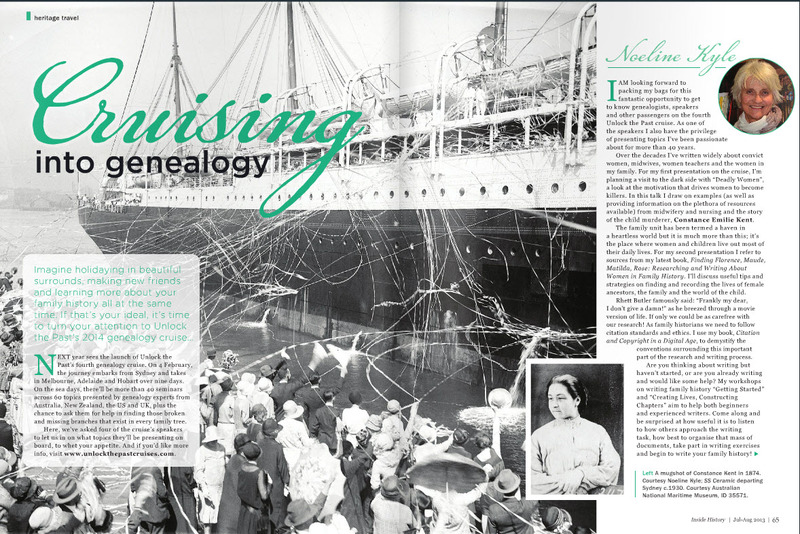 Unlock the Past’s 2014 genealogy cruise is being highlighted in Australia’s Inside History magazine. The current issue, number 17, is previewed online at http://issuu.com/insidehistory/docs/inside_history_issue_17_issuu and includes a 4 page article (pages 64-67) about the upcoming 9 day cruise, 4-13 February 2014 from Sydney to Melbourne, Adelaide, Hobart and back to Sydney. The article presents interviews with four of the upcoming speakers Noeline Kyle, Neil Smith, Thomas MacEntee, Chris Paton and it looks like a great event. Unlock the Past has additional long and short cruises planned for 2014 and 2015. If you want to check out more details have a look at www.unlockthepastcruises.com. As the keynote speaker on this year’s cruise I can tell you that this is a great way to travel, see new places, have a genealogy conference with great speakers and make lots of new friends. Because the atmosphere is relaxed you have the opportunity over meals or drinks to sit and talk and discuss genealogy to your heart’s content. The cruise also provides your non-genealogy spouse or family members with lots of alternative activities and shows. Tim Ellis is a name you may not recognize. He is the Keeper of the Records of Scotland and Registrar General for Scotland. In this important role he could have an important role in terms of what happens in Family History in Scotland. Mr. Ellis is interviewed in Issue 26 of Broadsheet the online publication of the Scottish Council on Archives. In the interview one question asks if he sees particular opportunities for cooperation across registration and archives services in Scotland. One part of his answer bodes well for the future – … ScotlandsPeople is a genuinely great service. And ScotlandsPlaces is also a growing resource. I’m impressed by what I’ve seen of the work of other Scottish archives in the digital sphere, too – but I do wonder if there’s scope for us all to work a bit better together to overcome some of the barriers and maximise the reach and benefit of what we’re doing. Another question revolves around what he would do with an unlimited budget – … I’d probably start by recruiting more archivists, conservators, digital curators and data specialists. Of course I’d welcome more involvement in digital facilities and capability, not just the NRS bur for the Scottish research and archives sectors as a whole … But primarily success is driven by people – people with the right skills, training, knowledge and motivation – and investment there is seldom wasted. I know that Mr. Ellis will be restrained by budgetary issues as any government position is, but I hope that some of his vision of cooperation and making records accessible online comes to fruition. If it does we will all benefit. Mr. Ellis’s activities will be worth watching. The back issues of Broadsheet are available online if you want to learn more about what is happening in Scotland’s Archives.